LAS VEGAS – August 13, 2015 – Switch, the Nevada-born technology solutions company, has just opened the doors of its newest 470,000-square-foot colocation data center SUPERNAP LAS VEGAS 9. The data center has already been awarded its Tier IV Design Certificate by the Uptime Institute and, like its SUPERNAP LAS VEGAS 8 data center, Switch expects SUPERNAP LAS VEGAS 9 to receive its Tier IV Constructed Facility Certificate and Tier IV Gold Operational Sustainability Certificate in January of 2016. This will make SUPERNAP LAS VEGAS 8 and SUPERNAP LAS VEGAS 9 the only two Tier IV Gold carrier-neutral colocation facilities in the world. At close to 500,000 square feet, SUPERNAP LAS VEGAS 9 will support up to 50 MVA of power and will bring Switch’s total square footage past 1.5 million in Las Vegas. Thanks to the revolutionary cooling technology inventions of Switch CEO and founder Rob Roy, SUPERNAP LAS VEGAS 9 is expected to follow in the footsteps of SUPERNAP LAS VEGAS 8 in achieving an average measured PUE of 1.18, far below the industry standard. Additionally, Switch has stated a goal to run all of its data centers using 100 percent renewable energy through its G100 program. 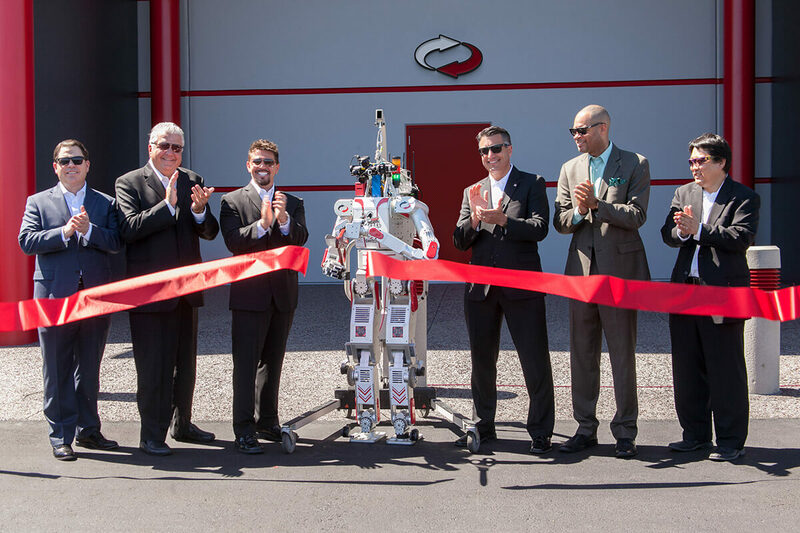 The ribbon-cutting ceremony featured UNLV’s Metal Rebel robot, which Switch sponsored to compete in the 2015 U.S. Defense Advanced Research Projects Agency (DARPA) Challenge Finals in early June. The team celebrated their 8th placement out of 23 competitors. Also in attendance were administrators and engineers from UNLV’s Howard R. Hughes College of Engineering. “Our team is excited to be here supporting technology growth in Nevada,” said Dr. Paul Oh, director of the drones and autonomous systems labs at UNLV. “We’re excited to continue our ongoing partnership with Switch in making Nevada a U.S. technology hub.” Switch’s SUPERNAP LAS VEGAS 7 houses the Intel Cherry Creek Supercomputer that was awarded to UNLV in 2014 thanks to a sponsorship from Intel and Switch. Cherry Creek ranks among the world’s fastest and most powerful supercomputers. Present at the ribbon-cutting were Nevada Senators Michael Roberson and Aaron Ford, Commissioner Steve Sisolak and Governor Brian Sandoval, who in his 2015 State of the State address said Switch will make Nevada the most digitally connected state in the nation, a feat which Switch has achieved. Governor Brian Sandoval presenting Switch Founder and CEO Rob Roy an award of recognition on behalf of the state of Nevada for Switch’s continued investment in the “New Nevada”. The first sector of SUPERNAP LAS VEGAS 9 is already sold out and construction has begun on SUPERNAP LAS VEGAS 10 and 11 which combined will add nearly 700,000 square feet to the campus. Switch is expected to open an additional three facilities in LAS VEGAS and up to seven facilities at their TAHOE RENO campus in the coming years and will expand internationally with locations to be announced soon. A look inside the highly secure SUPERNAP LAS VEGAS facility entrance. Switch, the developer of SUPERNAP data centers, is the revolutionary technology solutions company led by inventor and solutionist Rob Roy. As Founder and CEO he holds 218 patents and patents pending that have produced an essential and future-forward transformation in data center architecture, engineering, technology and operations. His vision also resulted in the creation of CORE, the world’s only $3 trillion independent carrier purchasing cooperative, and the highly respected “Truth in Technology” operating ideology. Designed by Rob Roy, the Switch award-winning Tier IV Gold SUPERNAP data centers are certified as the highest-ranking colocation data centers in the world and are maintained by the highest-rated mission critical operations teams. With more on-net, independent cloud providers than any other physical cloud gateway, SUPERNAP connects thousands of clients and providers from within the facility. SUPERNAP is the recognized world leader in colocation design, development and mission critical operations. Learn more at switch.com.